The mark on the base of the jug is generally thought to be that of Goodwin & Harris, at the Crown Works in Longton, Staffordshire. Other printed patterns have their name impressed in full. They appear in records from 1832 suggesting that this piece was not made for the coronation but at some time between 1832 and the death of William IV in 1837. Reverse with portrait of Queen Adelaide. Front with the star of the Order of the Garter. 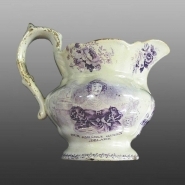 Earthenware jug with printed decoration in purple. 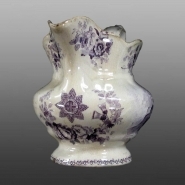 The jug is molded in a very curvaceous form. On one side is a portrait with the inscription "[OU]R BELOVED KING WILLIAM 4th". The king is depicted seated and in uniform. On the reverse is a portrait with the inscription "OUR AMIABLE QUEEN ADELAIDE". The queen is depicted in the fashionable dress of the 1830s. Beneath the lip, between the two portraits is a print of the star of the Order of the Garter, the highest order of chivalry awarded at the Sovereign's pleasure as a personal gift. Membership of the order is limited to the Sovereign, the Prince of Wales and no more than 24 members or Companions.